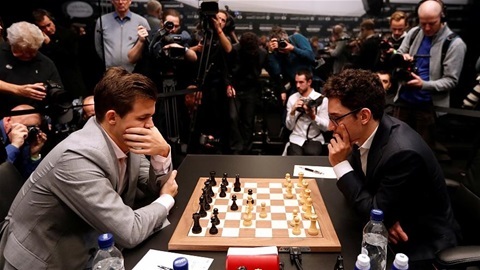 Norway's Magnus Carlsen won the world chess title for a fourth time after beating US rival Fabiano Caruana in three tie-breakers, after the pair had drawn 12 out of 12 classical games through the month. That tactical impasse forced the duellists into the faster-paced, best-of-four tie-breakers, which saw the Norwegian triumph and pick up a cheque for 550,000 euros ($855,601). The tie breakers were played with 25 minutes for each player per game, while the 12 previous classical-style games lasted up to seven hours each. Caruana will still collect 450,000 euros for his efforts at The College, a Victorian-era building in London's Holborn. Carlsen has been the world's top-ranked player for the past eight years. This year was the first time the Norwegian had won the championship without losing a single game.